Summary: A reflection on the nature of oppression in America, now and throughout history, with particular focus on racism, slavery, and post-9/11 war zones. Why Go? : Riffs sounds like it could a strong and important voice in this year’s Fringe festival, mixing spoken word, song, and visual media. Given the recent killings of black men by police authority across the country, it’s important to revive this discussion now more than ever before. Stand-Out Bits: As its name suggests, Riffs is nonlinear and nontraditional. In under an hour, it bounces across time periods, across themes, across autobiography to history to song. 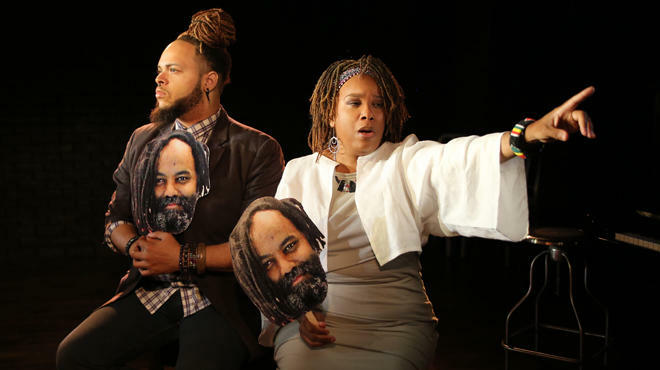 The piece was at its best when Karen Taylor, the writer and narrator of Riffs, related personal stories of her family history, displaying photographs of her ancestors and intimately revealing their hopes and fears. I wish the rest of the piece was as focused and rich as this early portion because once it abandoned her personal story, the narrative felt meandering, uneffective, and familiar. There are several great isolated moments, but Taylor loses us on the way there. I think that Taylor’s narrative, which attempts to tie together the various forms of oppression in the United States, would have benefited from more a more focused perspective. In another highlight, vocalist Tulani Kinard gives an impressive and moving rendition of “Strange Fruit,” arranged together with a chant to Ochosi, the Yoruba god of justice. It was a fantastic moment that left the audience clearly inspired. Riffs on Race, Love, and War plays at The Flamboyan Theater. The remaining show is 8/22 at 9:15pm. Summary: Young adult author Justine Drake (Lorinda Lisitza) finds success in her first Twilight-esque series about a teenage girl who finds love with a boy who is a descendant of an ancient dragon clan. Unlike Stephanie Meyer, Justine did not find her inspiration in her dreams; she wrote the stories as a fun, productive way to escape her disappointing marriage and demoralizing career. Drake’s readers, however, take the series far more seriously, and Drake finds that her books elicit some surprisingly extreme responses. Why Go? : YA Lit is the hottest part of the publishing industry, and Dragon’s Breath gives us a comical glimpse behind its phenomenon. Stand-Out Bits: This show was such a delight to watch! Witty, well-written, and energetic, it has a quality of production that you hardly find at independent theater festivals. I could see this on an Off-Broadway stage in no time. Lisitza is wonderfully neurotic and authentic as newbie author Justine, and the entertaining ensemble gives the show a positive energy and enjoyable pace. Writer Michael C. O’Day was particularly funny as fantasy elitist and internet troll Rocco McCafferty. Dragon’s Breath admirably explores how a fanbase can overpower an author’s intentions and turn a lighthearted paranormal romance into a tool for extremism. Dragon’s Breath plays at Teatro Latea on 8/23 at 7pm.